Is there anything more British than white cliffs? Apart from red postboxes, the Queen, and people saying "fine, thanks" when you ask how they are, even though they're stuck down a manhole with a man-eating shark? 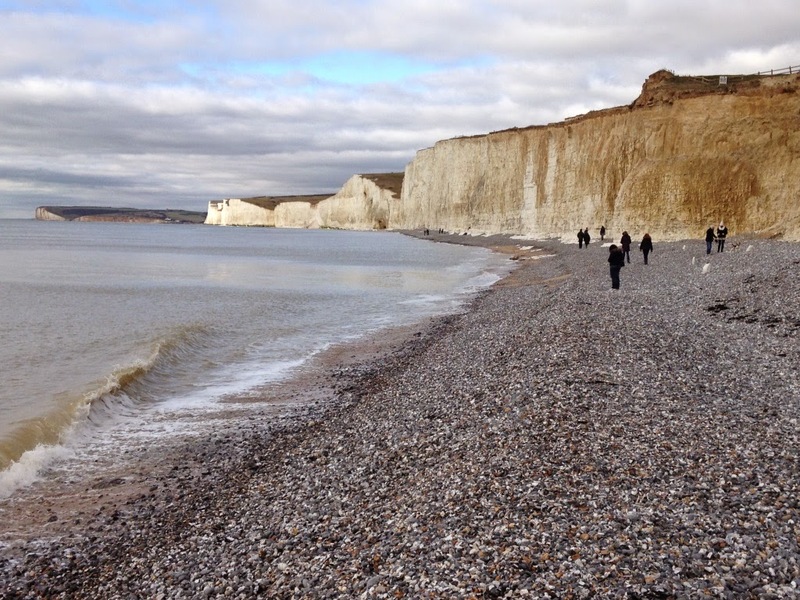 It is also nicely contrarily British to go to the seaside in February I think, which is how I found myself at Birling Gap and the Seven Sisters near Eastbourne today. And what an amazing place it is. There's a tea room and a shop on the cliff top and then a stairway down to the beach, so you can walk along and marvel at the beauty of it all from every angle. There was no guide book in the shop, which I was really disappointed about. However, there were signs explaining that Birling Gap was a haven for smugglers back in the 1700s. Coastguard cottages were built in 1817 to stop the smuggling and to help any stricken ships that got into difficulties. I did buy a book called Shipwrecks in Sussex, which lists many stories about thousands of pineapples and oranges being washed ashore and appropriated by the locals. It's on days like today that I really wish I was a geologist. If I made a list of jobs that I am most ill-equipped to do, geologist would be number two, just behind electrician (I am scared of electricity) and above bus driver (I can drive a Ford Fiesta, but only just). Geologists never stop being geologists - you occasionally overhear them when you're on holiday in Lanzarote or shopping in the Arndale centre, telling their companions about the type of stone they can see and what it all means. I wish I could do that, although it's possibly very irritating. It's really very sobering to realise that what is here today might not be here in a few years' time, thanks to coastal erosion. 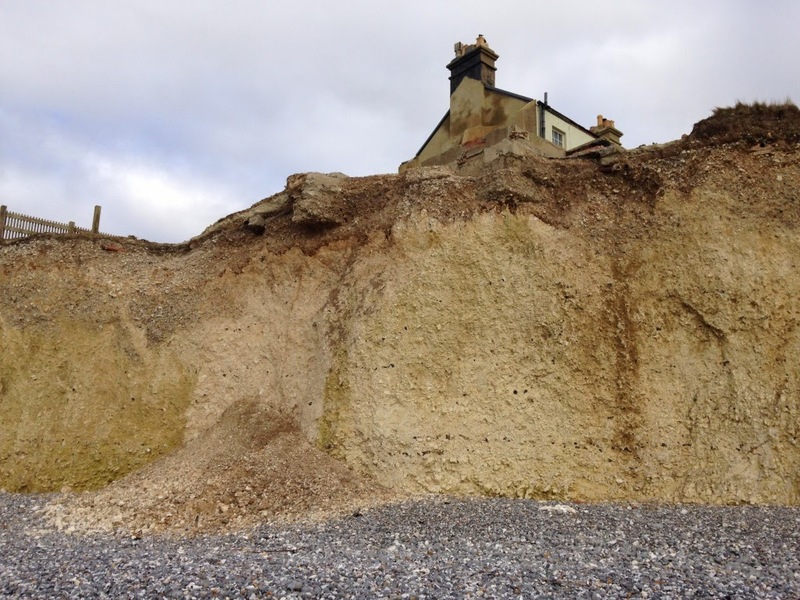 And the tea room at Birling Gap is also perilously close to the cliff edge. It's lovely - you can drink your tea and watch the light moving along the cliffs - but presumably it won't be there forever. Or even for another five years. I don't know. I need a geologist to help me out with that particular prediction. And it will be a shame if the tea room does disappear into the waves below, because it's one of the nicest National Trust tea rooms in Britain. There were people coming in and greeting the staff by name, there were dogs leaping out of car boots and making an excited beeline for the cafe (they're allowed in to a section of it)...it was a very happy, spacious place, with lots of comfortable furniture and smiling people. 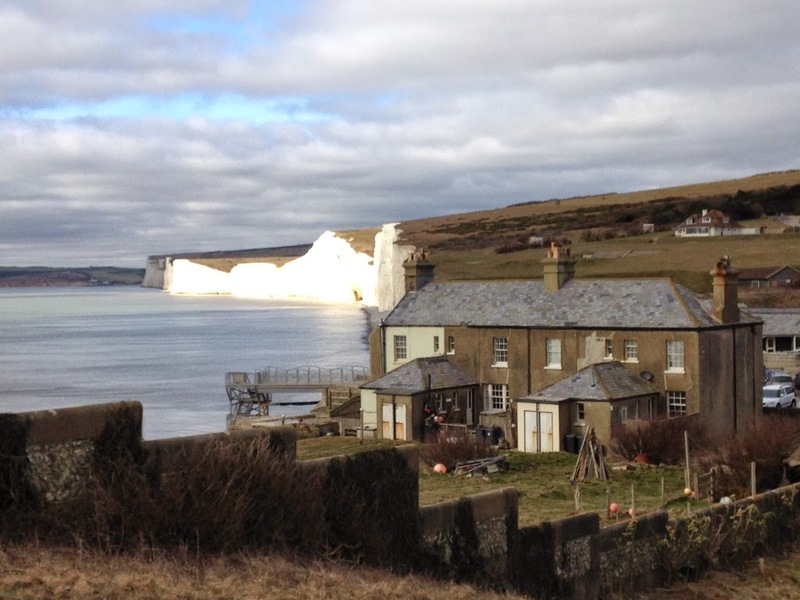 More importantly, BIRLING GAP TEA ROOM HAD SCONES. 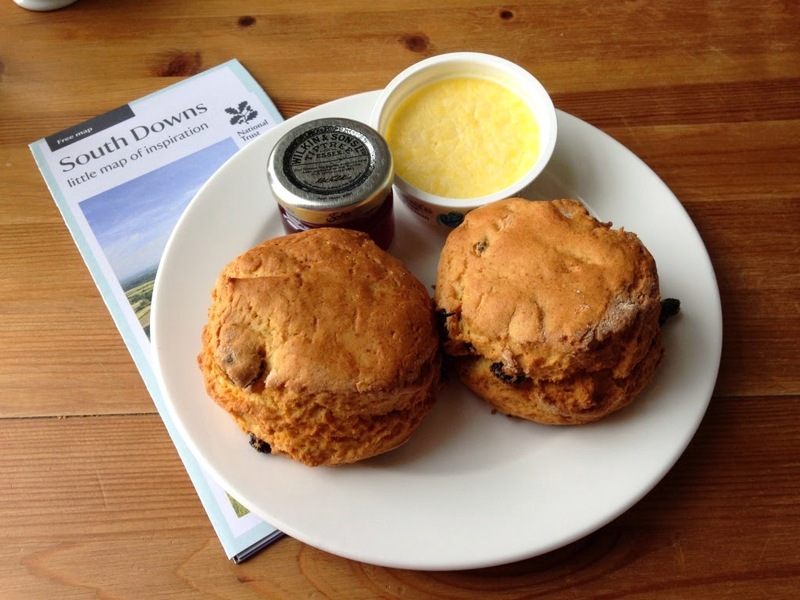 Regular viewers will know that I've been experiencing a bit of a scone famine in 2015 so far - despite visits to Aberdulais and Leith Hill, I had yet to find a National Trust scone THIS YEAR. I will admit that it's been very worrying and I did consider that I may have to make myself redundant, or become the National Trust Sponge Cake Blog. But Birling Gap came through for me - two lovely sized scones that were a little on the dry side, but after 55 days without a scone I didn't care and I ate every crumb. 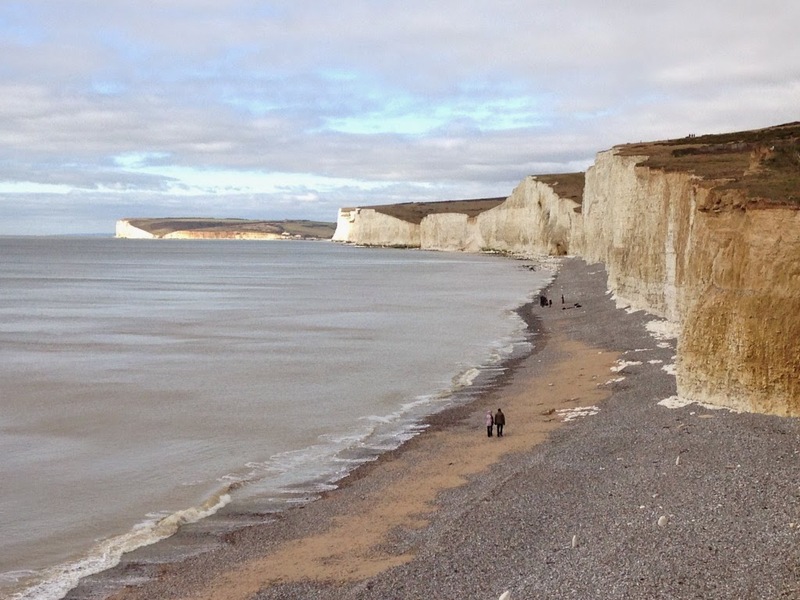 So I highly recommend that you go to Birling Gap as soon as you can - it has scones, stunning views, and a lovely friendly tea room that might not be around forever. 55 days without a scone!? It's been a difficult time.